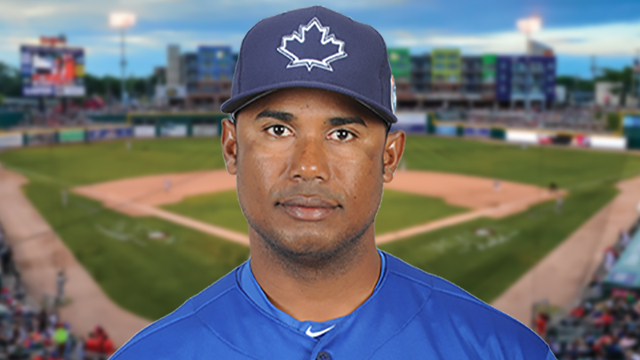 LANSING, Mich. - Cesar Martín, who led the Gulf Coast League Blue Jays to a combined .684 winning percentage during the last two years, will serve as Lansing Lugnuts manager for the 2017 season, the team announced Thursday in conjunction with the Toronto Blue Jays. Martín will be joined on staff by first-year pitching coach Willie Collazo, returning hitting coach Donnie Murphy, catcher-turned-coach Chris Schaeffer, returning athletic trainer Drew MacDonald and first-year strength and conditioning coach Kyle Edlhuber. 2016 Lugnuts manager John Schneider moves up to the A-Advanced Florida State League to manage the Dunedin Blue Jays, and 2016 pitching coach Jeff Ware was promoted by Toronto to Minor League Pitching Coordinator. The 35-year-old Cesar Martín (pronounced "mar-TEEN") was originally signed by the Blue Jays at the age of 17 out of San Pedro de Macoris, Dominican Republic. A third baseman, he played three years in the Jays' organization, advancing as high as Auburn in 2002. For the next 11 seasons, Martín worked as a coach with the Jays' Dominican Summer League affiliate, managing the club to a 41-29 record in 2013. After one year as Bluefield Blue Jays hitting coach, Martín was named the manager for the rookie-level Gulf Coast League Blue Jays and posted impressive 39-19 and 39-17 campaigns in 2015 and 2016 respectively. He becomes the 14th manager in Lansing Lugnuts team history. Pitching coach Willie Collazo ("coy-AH-so"), 37, enters his first year in Lansing after serving as Vancouver Canadians pitching coach in 2016. Originally drafted by the Atlanta Braves in the tenth round in 2001, he pitched in 368 minor-league games and made six relief appearances for the New York Mets in 2007. Collazo is a native of Carolina, Puerto Rico. Hitting coach Donnie Murphy, 33, returns for his second season in the Midwest League, presiding over an offense in 2016 that featured All-Stars Juan Kelly and Andrew Guillotte. Murphy played parts of nine seasons in the Major Leagues, spanning from 2004-2014 with the Royals, Athletics, Marlins, Cubs and Rangers. A fifth-round Kansas City Royals pick in 2002, Murphy hails from Lakewood, California. Coach Chris Schaeffer, 29, has been a member of the Blue Jays system since the 2011 season, playing 28 games with the Lugnuts in 2012 and 13 games with the Lugs in 2014. A product of North Carolina State University, Schaeffer enters his fourth year as a coach with the organization. He is a native of Port St. Lucie, Florida. Athletic trainer Drew MacDonald enters his fifth straight season with the Lugnuts. He originally interned with Toronto in 2009 before joining the Baseball Canada Junior National Team in 2010. A native of Teeswater, Ontario, MacDonald moved up to Lansing after spending the 2011 season with the Bluefield Blue Jays and 2012 with the Vancouver Canadians. Strength and conditioning coach Kyle Edlhuber makes his Lansing debut in 2017. Edlhuber, a graduate of Wisconsin Lutheran College, spent his first two seasons in the Toronto Blue Jays organization alongside Cesar Martín with the Gulf Coast League Blue Jays and was named the 2015 GCL Strength and Conditioning Coach of the Year by the Professional Baseball Strength and Conditioning Coaches Society. He currently resides in Milwaukee. The Lansing Lugnuts open their 22nd season in the Midwest League on Saturday, April 8th, at Cooley Law School Stadium and it's up to Lugnuts fans to choose the Opening Day Giveaway, presented by Auto-Owners Insurance. Will it be a tapper hat, scarf or backpack? The winning giveaway will be announced on February 3rd. For more information, call (517) 485-4500 or visit lansinglugnuts.com.